A common misconception is that Tattoo Eyeliner Removal is not possible. Semi Permanent Makeup Eyeliner, Tattooed Eyeliner and Eyeliner Migration can be removed using laser and non laser techniques provided that proper precautions and protocols are followed. 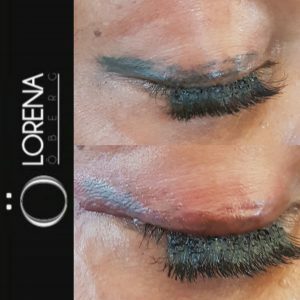 We have performed hundreds of Laser Tattoo Eyeliner removals and are widely considered world experts with Lorena demonstrating this procedure to professionals at conferences world wide. Depending on the age of the eye liner and the concentration of ink, we will use the method that will help us achieve the best result. Often we will use a combination of laser and non laser techniques. Migration of eyeliner can also be treated very effectively. In fact, migration is one of the easiest SPMU problems to resolve with noticeable results even from the first treatment. Please see our page with frequently asked questions about this procedure here. 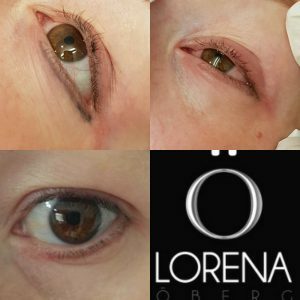 Tattoo Eyeliner Removal is a very delicate procedure and one that is performed only by Lorena Oberg herself. She is considered the world leader in this procedure and the video below will illustrate how confident she is removing eye-liner. The first step is to book a consultation with Lorena. During which she will asses the full extent of the problem and derive the best possible course of action, specifically tailored to your needs. Laser removal is especially effective on eyeliners that have been done for over 3 years. What may look, to the inexperienced eye, to be a very dark liner may in fact be easy to remove. Lorena will be able to advise you on the best way forward. Using lasers in the eye area requires protection to the cornea and the only way to achieve this is by using Ocular Shields. 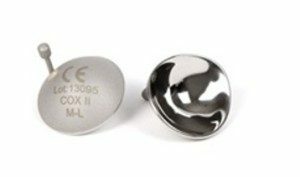 These are placed inside the eye to protect your eyesight. Ocular shields are surprisingly comfortable once inserted. However, lasering is not. Laser tattoo removal is a painful process and although we take a lot of care to minimise discomfort, there is no getting away from the reality that it’s an uncomfortable procedure and you will need healing time of up to 10 days. Although most report that concealer can cover any issues after a couple of days. The fact is that tattooed eyeliner and migration CAN be corrected. It’s a highly skilled and uncomfortable procedure that can take several procedures for complete results. Lorena is an expert in this field and performs this treatment daily.